8th Apr. – 13th Apr. A film crew has arrived in a small town in Kerry. They’re here to film ‘The Quiet Valley’, a story of love against the odds with all the clichés you would expect from a Hollywood movie set in Ireland! The locals care little for the film other than for the work it brings to the community. We meet two extras; Jake (Owen Sharpe) and Charlie (Kevin Trainor), who spend their days lurking in the background of shots, and all to earn forty pounds per day! 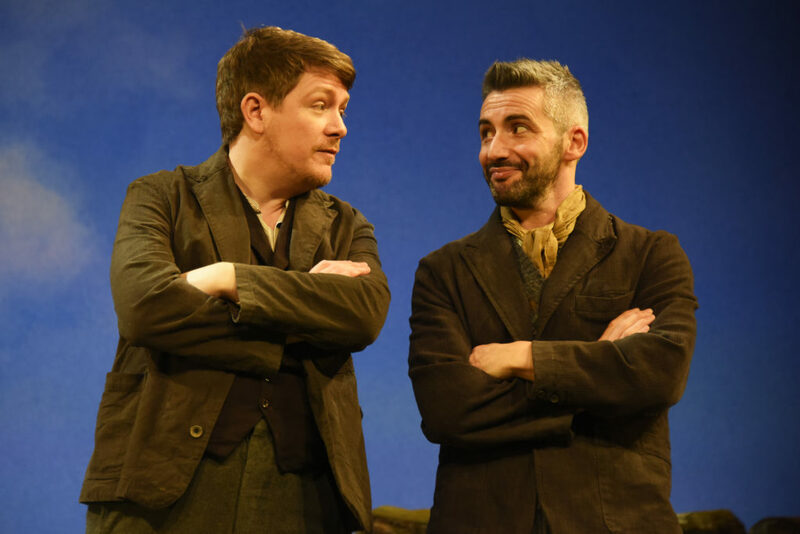 The play also gives us brief flashes of a multitude of other characters, such as the movie stars and crew, in this sad and sweet tale of life in rural Ireland. 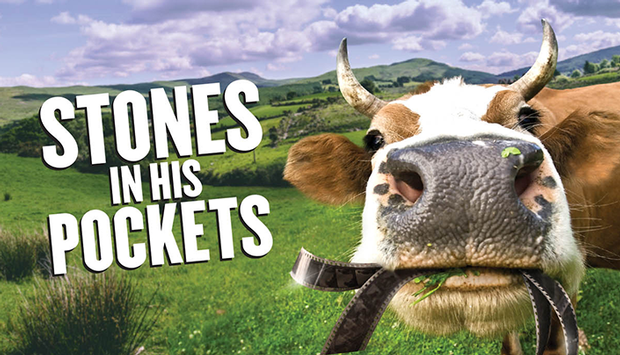 Stones in his Pockets was written by Marie Jones for the DubbleJoint Theatre Company in Dublin in 1996. The original production was a huge success, with actors Conleth Hill and Sean Campion taking the lead roles. It later travelled to London’s West End, where it won two Olivier Awards in 2001, for Best New Comedy and Best Actor. This is a production by the Theatre Royal Bath which is directed by Lindsay Posner, who previously directed ‘Death and the Maiden’ and ‘God of Carnage’, among many others. There is a simple set, with a small patch of grass and a stone wall on one side of the stage. There is a backdrop with a blue sky and a scattering of clouds. It suggests a perfect day in this rural setting. The only real prop on the stage is a large chest which helps the actors with their occasional costume changes. Much is left to the imagination in this production as the play features two actors playing 15 parts, often changing gender and nationality at a moment’s notice. The fluidity of these changes are what makes the production work. Marie Jones is an actor as well as a playwright and it shows as this work is the perfect opportunity for an actor to show their range. There are some wonderful characters in the play, such as the self-absorbed Hollywood star Caroline Giovanni who wants to spend time with Jake to perfect her Irish accent! There are also Hollywood directors, producers and the local inhabitants. The most tragic of these individuals is Sean Harkin, a local drug user who seems desperate to be in the film. While some elements of the play may now seem dated (Xtra-vision or a Commodore 64 will mean little to younger members of the audience) the main premise is still as relevant as ever. It touches on men’s mental health which is possibly more of an issue today than it was 20 years ago! The play has been performed many times, with a number of the actors involved going on to become household names. The two actors at the helm of this production do well with their parts, but some audience members will have fond memories of previous productions. Kevin Trainor is impressive as Caroline Giovanni, but some of the other characters don’t quite spark to life. Owen Sharpe is bright and bubbly in his various roles. It’s a solid rather than a spectacular rendering of the script but another chance to see this well loved play.